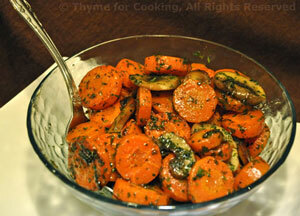 Buttered Braised Carrots, Mushrooms, Thyme for Cooking easy side dish. Carrots and mushrooms, sliced, lightly browned then braised to finish. A bit of oil is added to keep the butter from browning. Heat butter and oil in a small skillet over medium-high heat. Add the carrots, mushrooms and stir-fry until lightly browned, about 5 minutes. Reduce heat to low, cover and cook 10 minutes longer. Stir in thyme and serve.